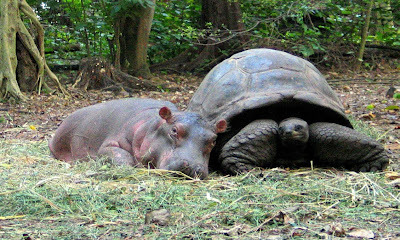 Meet Owen and Mzee, the hippo and tortoise who became world-wide interspecies celebrities as a result of their astonishing friendship. Owen, a baby hippo, was rescued in the Indian Ocean after the 2004 earthquake. 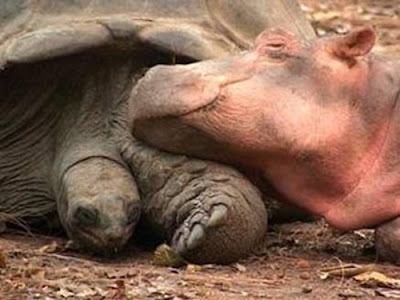 He was put in a pen with Mzee, a 130-year-old Aldabra Giant Tortoise. Over time the two became inseparable companions - eating, sleeping, swimming, and playing together. And they became famous; Owen and Mzee: The true story of a remarkable friendship hit the New York Times bestseller list. There's a great article in National Geographic about the pair, and you can check out much more at the Owen and Mzee web site.